Difference between revisions of "Watch Recordings"
The recordings are organized into Recording Groups and Shows. Use the left, right, up and down arrows to navigate between the list of shows and the episodes of a show. Use the fast forward and rewind keys ("<" and ">" on a keyboard) to navigate between recording groups. The Recording Group names may be displayed across the top depending on the theme. If they are not displayed across the top, the names are visible in the entry for ''All Programs'' as for example ''All Programs - Default'' (''Default'' recording group) as you navigate through the recording groups. There are two groups which are not shown and are not accessed via the fast forward and rewind buttons. These are ''Live TV'' and ''Deleted''. 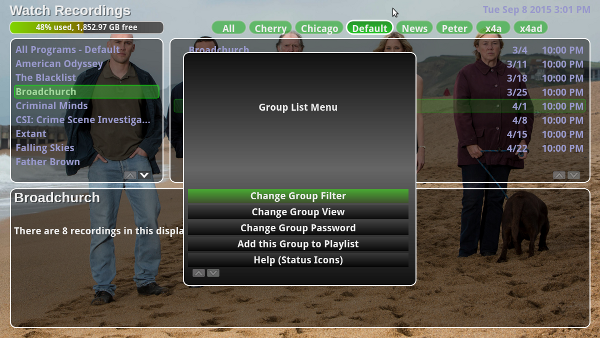 You can select these groups, or any other group, by pressing ''Menu'' (M) and selecting ''Change Group Filter''. If you accidentally deleted a show, you can for a period of time find it in the ''Deleted'' group and play it or press ''Menu'' and undelete it. Anything that you had watched on Live TV is in the ''Live TV'' group where you can watch it again, or move it to another group if you want to keep it. The length of time that Live TV and deleted recordings are kept is set in Front End Setup-> Video-> General (Auto Expire). See [[Configuring_Frontend#General_.28Auto-Expire.29]]. 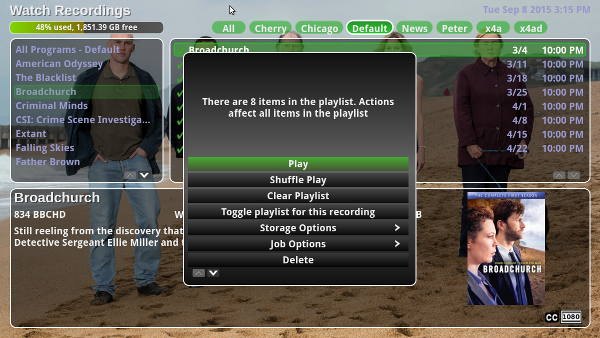 Once you have navigated to a recording in the list, play it by pressing ''Select'' or ''Play''. You can use ''Fast Forward'' and ''Rewind'' to move around a recording. Another way, which many find more useful, is skip forward and back. The forward arrow skips forward and back arrow skips backward. Up and down arrows skip by a larger amount. To skip forward a certain number of minutes, enter the number with the numeric keypad and press right arrow. The ''Play'' button toggles the Pause state. You can set a bookmark using ''Select''. Also you can configure the frontend to automatically set a bookmark if you exit during playback. That way when you go to play that recording again it will resume where you left off. Use Setup-> Video-> Playback General Playback (2/8) ''Action on playback exit''. Changing of volume through MythTV may not work in all cases, particularly if you are using digital output. Changing volume this way is only enabled if you have selected to use internal audio controls, using Frontend Setup -> Audio Audio Mixer. See [[Configuring_Frontend#Audio_Mixer]]. Press [[Image:RemoteVolup.png]]/[[Image:RemoteVoldown.png]] to increase/decrease the volume. Individual recordings from each recording group are on the right of the screen. Use the [[Image:RemoteRight.png]] [[Image:RemoteLeft.png]] keys to move between the Recording Groups and recordings. Once you are in the recordings pane, use the [[Image:RemoteUp.png]] [[Image:RemoteDown.png]] keys to move between recordings. Press the [[Image:RemoteSelect.png]] key to play that recording. You can step through the different screen [[aspect ratio]]s with the [[Image:RemoteZoom.png]] key. This cam also be accessed from the Menu (M key) in case your remote does not have a Zoom key. |Can be used by some stations as a compromise between 4:3 and 16:9. This is a useful setting to correct the picture when the broadcast station has compressed it to display school closing information along the bottom. - ESC Exit Zoom mode and return to original size. Navigate to the Episode in the episode list and press Press [[Image:RemoteMenu.png]] to bring up the Recording Options popup. The ''Playlist Options'' Menu mentioned above has a number of other commands. Using the playlist you can move a bunch of recordings to a new recording group, delete a bunch of recordings, mark a bunch of recordings as watched, and a number of other tasks. This is a lot easier and quicker than doing these tasks individually one episode at a time.